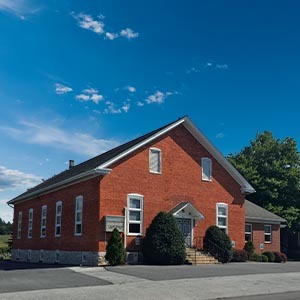 Gospel of Grace Community Church was founded in 2016 and meets in the former Kinzers Mennonite Church building in Lancaster County, Pennsylvania. ​We hold to the London Baptist Confession of 1689 and preach the Doctrines of Grace. Therefore our sole authority for teaching and preaching is the Bible. Therefore we direct our corporate life and ministry according to the written Word of God. Therefore we make Him central in our worship and seek His glory above all things in our lives. Therefore we seek to diligently live and boldly speak as His representatives in our world, community, and families. Therefore we preach the Gospel and pray for God to do what only He can do. Therefore we give glory to God alone for the salvation of sinners. Therefore we preach Christ in the gospel as the source of life for unbelievers and believers. Therefore we seek to live out of the resources of the gospel, applying it to all of life, in the hope of eternal life. Therefore we look away from ourselves and trust the work of God’s Spirit in and among us. Therefore we desire the fruit of the Spirit in our lives and seek to fellowship, pray, and witness in the Spirit. Therefore we put a priority on prayer, gathered and informal, for the help and power of the Spirit of God. Therefore we seek to spend time in God’s written Word that we might become like the incarnate Word. Therefore we seek to stir up the variety of spiritual gifts that we might better represent Christ as His body. Therefore we seek to cultivate godly family life as husbands, fathers, wives, mothers, and children. Therefore we seek to be faithful to the leaders, people, and ministries of our local church in our prayers, attendance, and financial support. As healthy family life is important to healthy church life, we promote godliness in the home and seek to balance family life with church life. ​Therefore we seek to cultivate an atmosphere of joy and reverence in our gathered worship. ​Therefore we seek to convey in our lives both the joy of the Lord and reverence for His awesome holiness. Therefore we seek to build one another up by fulfilling the “one anothers” of Scripture. Therefore we show hospitality to one another in our homes and serve one another in practical ways. Therefore we seek to establish small groups to cultivate close fellowship. Therefore we encourage the cultivation of one-on-one mentoring and discipling relationships. Therefore, we seek to apply the Word preached to unbelievers, inviting them to Christ. Therefore we seek to be aggressive, creative, and prayerful in our efforts to win the lost. Therefore we seek to have meetings and activities that are aimed at reaching the lost. Therefore we seek to pray for and support gospel outreaches beyond our immediate area. Therefore we seek to equip parents to bring up their children in the discipline and instruction of the Lord. Therefore we seek to help one another discover our spiritual gifts. Therefore we seek to provide opportunities for the use of our various gifts. Therefore we are alert to leadership gifts and opportunities for their exercise among us and elsewhere. Therefore we look for open doors of opportunity to send out workers into God’s harvest. Biblical truth, Gospel grace, Christian joy, serious discipleship, warm fellowship, passionate evangelism, selfless service, and eternal hope. ​Pastor Chuck Vuolo was converted while in college at the age of 18. He has been married to Diana for 35 years and they have three grown children. He was a pastor in north Philadelphia for 8 years, which included ministry to Cambodian refugees. For 19 years he served as a pastor in Downingtown, PA. Since 2005 he has ministered among the Old Order Amish here in Lancaster County. Since that time he has also helped to plant a church in Kingsville, MD.